At Some Point, We All Must Go. Sending out Doug + Colletta Rhoads from our midst to plant a new missional team within Block KK of Soshanguve. Shortly after I returned to Pretoria to begin work as Field Staff a year ago, our missional community quickly realized that NieuCommunities still found itself entering into a season of transition. Initially we believed that as several Field Staff had moved into different areas of mission around the country or with CRM in other parts of the world, a transition of leadership was what God had in store for our community. 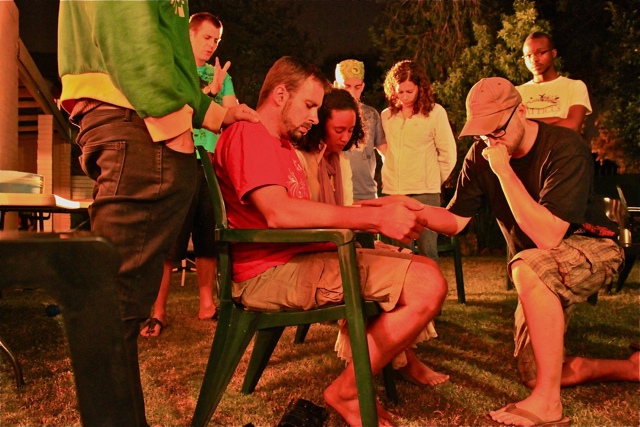 In October 2009, that change was clarified, resulting in a dramatic shift of focus (from hosting a 42-week missional apprenticeship program each year, which largely served North Americans, to seeking to apprentice South African leaders alone into sustainable mission around the globe) that caused us to move into the heart of Pretoria, eventually settling within the Clydesdale neighborhood. Back to my initial sentence, however. When we intentionally allow the Spirit room to move among us, seeking to listen for His voice, God always shows up and speaks. Jody playing the exasperated Father to Noel's eager son in a skit. After a season of this, we began to enter another season of clearness and discernment with two other groups of people near the end of 2010, Jody Thomas, and Doug + Colletta Rhoads. 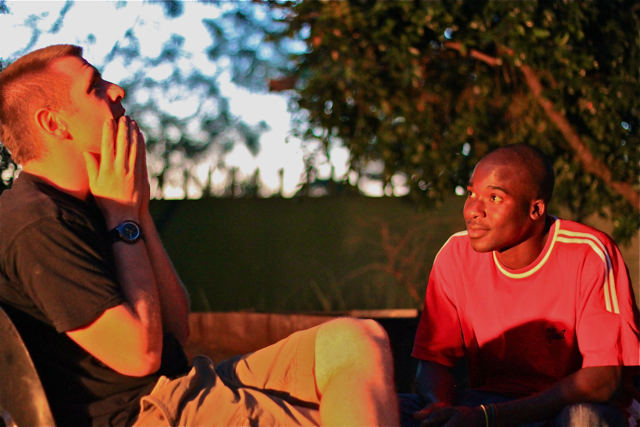 Jody was an apprentice with NieuCommunities in 2008 and had a profound year through which God grew a tremendous burden and calling to work alongside Zimbabwean refugees within South Africa, ultimately possibly leading towards full-time missional work within Zimbabwe itself. He had returned for a 9-month internship with NCSA for the express purpose of testing this passion. With just over a month remaining, we are excited to report that not only is Jody engaged to a wonderful Rwandan named Francine, but that Jody is moving towards returning to NieuCommunities at the end of this year as Field Staff with his new wife, having clarified his call and sensing that a further season of development and work among the existing Zimbabwean community here in Pretoria (There are many!) is where he is to focus at this time. The Rhoads walked a much different path than Jody. Doug Rhoads has been involved with NieuCommunities since 2005, and is the longest remaining Field Staff among our team. Colletta Rhoads (Formerly Cole) was an apprentice alongside myself and Curtis Love in 2009. Not only did she sense a call to South Africa, she fell in love with Doug, marrying him this past June. Returning to our community in early August, they had a growing sense that God was moving them towards life and mission within Soshanguve, a large township outside Pretoria that another CRM team, InnerChange South Africa, works within. Yet they were unsure of the what, when, and how. Clearness begins again, and was difficult at times with the adjustment to married life, shared ministry, and the individual callings Doug and Colletta were now bringing together. Ultimately however, in January the Rhoads began exploring starting an Ethne team out in Block KK of Soshanguve, another expression of CRM that focuses on work with a specific ethnic group of people. Through a long process, this has been confirmed! Curtis Love praying over the Rhoads at the close of a late summer evening. Thus, our community found itself circling Doug and Colletta two weeks ago, engaging in the bittersweet custom of laying hands on them to send our dear friends out from our midst…this time not out of the country, but to a sister city + sister mission within our little tribe. 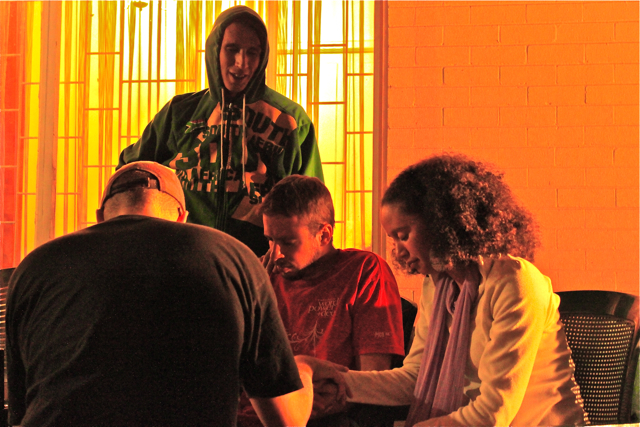 As we commissioned them outwards, we prayed over them, realizing that in a deep way, we are all sent ones. To be involved in this work means to embrace the inevitable reality that at some point, we all must go, following the wind of the Spirit as faithfully as possible. Well said Chris, and well done. Thanks Rob and Mom! I appreciate the encouragement!